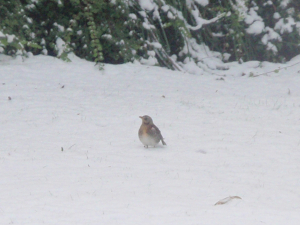 Observation - Fieldfares in the garden - UK and Ireland. Description: Three fieldfares appeared in the garden, eating the berries from the tree and being very aggressive with the other birds paricularly the blackbirds. Three fieldfares appeared in the garden, eating the berries from the tree and being very aggressive with the other birds paricularly the blackbirds.